While many of you along the Eastern Seaboard dealt with the rains from Hannah, we were west enough that we received no rains. The good part of tropical storms / hurricanes is that they leave in their wake the clearest skies. 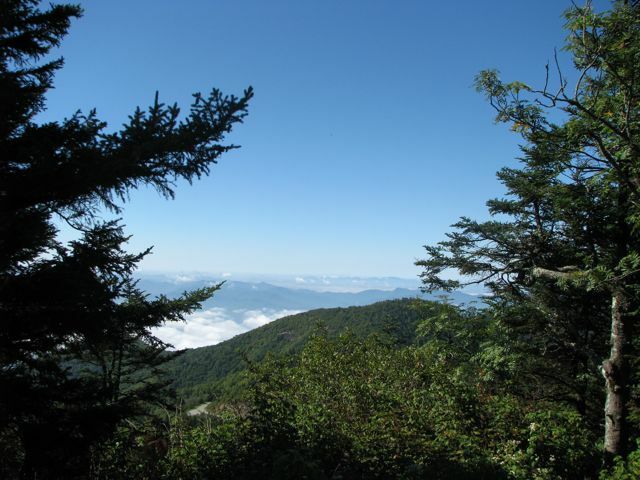 Remember, they call some of our mountains the Great Smoky Mountains for a reason – the constant haze. But a day like Sunday chased all the haze away and the views were spectacular. So excuse a no-dog post while I share some of the views we saw Sunday. As always, you can click on any picture to get a larger view. 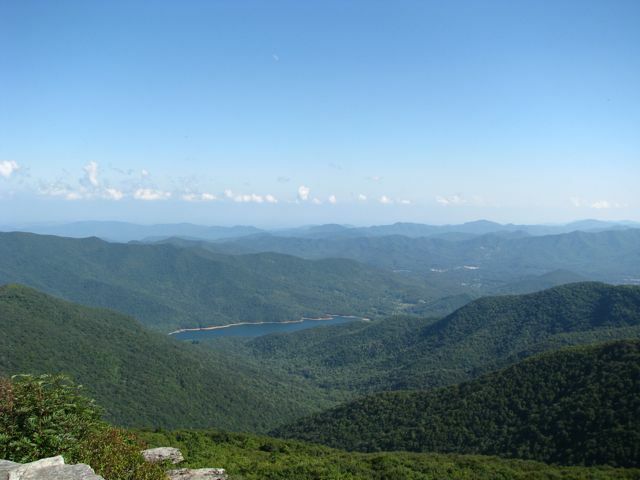 First up is a view from Waterrock Knob looking south. You can see the clouds hugging the valley floors below and also see mountain range after mountain range going off into the distance. 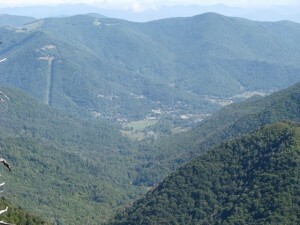 Second is also a view from Waterrock but looking into the town of Maggie Valley. 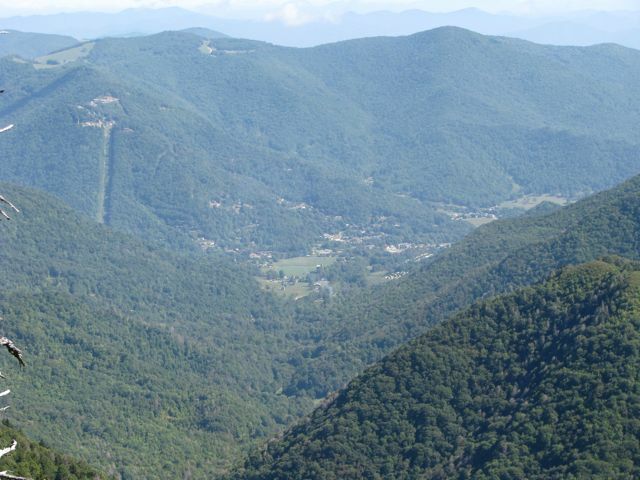 Look in the upper left corner at the meadows on top of mountains and that is Cataloochee Ranch – my neighbor (yes, the Herd lives up there too). 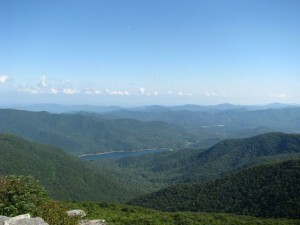 Finally is a picture from Craggy Pinnacle looking down into the Asheville Reservoir. If you enlarge the picture, you can see clearly that we are still significantly below our expected rainfall – despite the rain from Fay recently. We need about a foot of rain to catch up and to keep the upcoming fire season in check. Back to dogs tomorrow – I promise! NO need to apologize! The shots are beaWOOOOtiful!! How about DOGS in the shots next time? Holy Puppy Poop!!!! How many are in The Thundering Herd? We’re a pack of four Desert Pups from Arizona but you look like you got us beat. Great photos, looks like the Blue Ridge Parkway. You pups near there? Our Mom grew up in Virginia, right near the NC/Tenn border. Our Aunt Sarah still lives back in Virginia and she goes to the Parkway all of the time. It’s beautiful country. Uh oh! Better listen to our future VP!! Or else she might send the future Prez, Turbo over!! Do you live somewhere in those mountains? Really?! How do you find your way about:) Oh…Ms. Natasha must know the place well…right? If you like our stories and photographs, you can support our efforts by shopping through this portal with Amazon. Just enter your search term and follow the link. We receive a small commission from Amazon for any purchase you make.